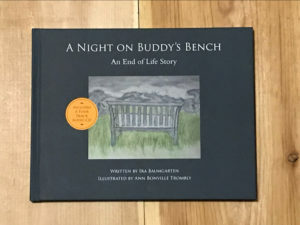 A Night on Buddy’s Bench: An End of Life Story is Ira Baumgarten’s sweet tale of grief and dying. Can such a story be sweet? Yes! It’s an adult picture book, beautifully illustrated by Ann Bonville Trombly with mystical impressions of a hazy scene on an island in Maine. Fog covers the sounds of offshore boats. A solitary bench is positioned to look out on the water. A mystery unfolds. Baumgarten was inspired to write this story after three deaths in his immediate family. In it, he attempts to address the inexplicable sorrow and confusion that occur when a loved one dies. He proposes, subtly, an alternate reality. Not one based in a foregone religious conclusion or a cultural assumption. Rather, his character hovers in a dream-like state as he faces his own imminent mortality. The treatment of death and grief in Baumgarten’s piece borders on fantasy as the old man sees himself walking to Buddy’s bench in the middle of the night to toast a lost friend and to see the sun rise over the mists. He has a conversation with an unnamed visitor who has also come to the bench. He sees himself pouring whiskey into two shot glasses to share with his long-gone buddy. Magic happens. Weeping, for we all must weep for what we have lost. Silence, for in silence we understand solace, beauty, and comfort from something greater than ourselves. Singing, for in singing we pour out our hearts and regain our voices. A Night on Buddy’s Bench underscores the universal unanswerable: What does it mean that we die? The story is designed to initiate end-of-life conversations that might comfort both the living and the dying. It’s a beautiful book accompanied by an audio CD, perfect for sharing with family members and friends, folks who are in hospice, or anyone dealing with loss. All profits from the sale of the book are donated to the National Hospice Foundation. Check it out on Amazon or at http://www.anightonbuddysbench.com/.